This is a partial preview. Full document is 183 slides. View large preview. 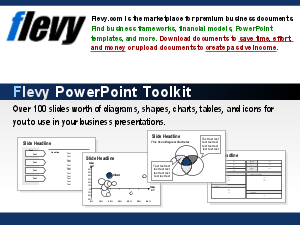 47-slide PowerPoint deck. This is a robust collection of frequently used consulting templates. It is the third in a set of 3. Please click my profile to see the others. PowerPoint Diagrams Compilation? Bain Presentations? Channel Distribution Strategy Example? Or something else.